Huge database at Tebeosfera . 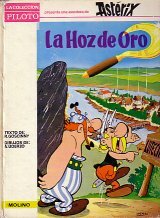 Other Asterix languages in Spain: Asturian, Basque, Catalan, Galician, Valencian. Ediciones del Prado published some titles in english and french. Circulo de Lectores published, only for its members, titles 1-24. Alfons Moliné reports an old Spanish edition, Editorial Molino. This edition has a different map text, but seems otherwise the same as the later edition listed. Many publishers, without apparent changes in the main text. Although the recent Spanish books have been distributed by several publishers, their books seem to be basically the same edition unlike some other languages, spoken in Spain which have a separate translation in an old Mas_Ivars edition. A separate Spanish edition for South America was published in the 1970's and again from 2015. Two Jaimes Libros editions occur. This one which text is exactly the same as the Spanish edition (Castillian) and another one which is Catalan. There is no map text in this edition. The space under the map is left completely blank. Also note the empty yellow banner which has no name of the publisher.